Let's first examine the seven tabs located at the top of the simulator's user interface. By accessing each of the different tabs, you will have the ability to navigate through different areas of the simulator. Note: upon clicking the desired tab, additional links will appear in the space below the tabs. 1. My Home provides a quick look at your Investopedia account. You can also change your profile settings. 2. Portfolio provides a summary of your current portfolio holdings, your stock watch list, and your trading history. 3. Stock Research contains tools for researching and selecting the companies you want to trade, such as, a research section, a ticker symbol lookup tool and much more. 4. Watchlist allows you to track stocks without dedicating capital from your portfolio. 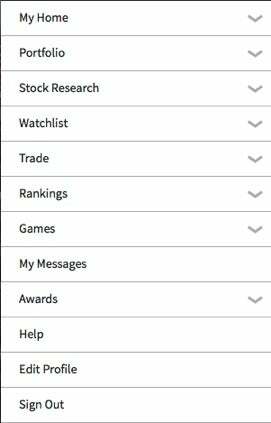 You can manage the stocks you are watching and add new ones. 5. Trading contains the part of the simulator that you'll need to input your trade orders and review any outstanding open and failed trades. 6. Ranking shows your current placing for any specific competition. 7. Games allows you to create, manage and review the games you're participating in and also join existing games. By default, users are invited to join an Investopedia game. We recommend you complete this how-to guide within the "Investopedia Competition (no end)" game. 8. My Messages is where you can check messages that have been sent to you, as well as send messages to other users. 9. Awards contains various awards that you can earn in exchange for completing simulator activities and/or goals. 10. Help will provide you with tutorials that will help further your knowledge, as well as general questions that you may have about the simulator. Don't worry if you don't understand all of the tools at your disposal. Our how-to guide will explain the details of each component as you go. Learn more about online stock simulators, and how they make learning about stocks as fun and easy as playing a game. How Do You Use Stock Simulators? Stock market simulators let you pick securities, make trades and track the results, all without risking a penny. Learn more about building a portfolio.